Understanding what supports strong relationship quality among formerly incarcerated men and their partners could have an impact on individual, interpersonal, and community safety and wellbeing. 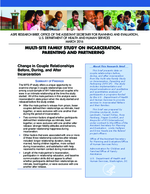 The information in this research brief is drawn from a couples-based longitudinal study of families affected by incarceration, focusing on 641 couples where the male partner was incarcerated at the beginning of the study and released prior to the completion of the final study interviews. The findings give insight into issues facing couples before, during, and after incarceration and identify key factors that predict stronger couple relationships after release.